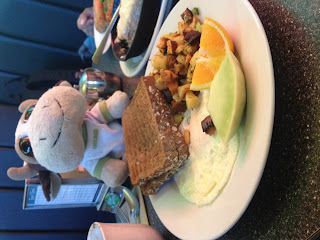 We had heard good things about Diner Deluxe from friends who had visited Calgary, and had also seen it on Food Network’s show, You Gotta Eat Here and saw some interesting things including their oatmeal. So we decided that we had to give it a whirl while we were in town. The interior is that of a funky, retro diner, with your classic 50’s diner tables, chairs and banquettes. We decided to order The Best Oatmeal that we’d seen on You Gotta Eat Here, along with the crispy potato pancakes and the classic breakfast. The fried oatmeal had a hint of maple taste to it, was very dense, and served in a small cast iron skillet. On it’s own, it tasted plain and heavy, but tasted delicious when combined with the thick and nicely tart lemon curd, and swimming in the vanilla bean cream. The crispy potato pancakes made with Yukon gold potato, green onions and topped with cilantro sour cream were extremely crispy outside. However, once cut into, they lacked enough binder to stay together and fell apart into a potato hash. The inside was not as crispy as the exterior, tasted plain and unseasoned. The accompanying farmers pork sausage was very dry and lean, far too lean for my liking. I would have enjoyed the potato pancakes more if they’d had more seasoning and had stayed together in an actual pancake, and had the pork sausage been juicier. 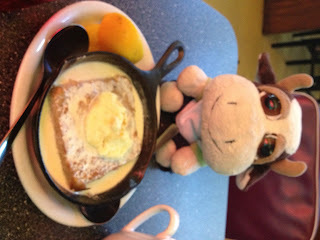 The classic breakfast consisted of two eggs any style, has brown and toast. We chose eggs over easy, which were perfectly cooked and soft. The hash browns consisted of a mixture of both plain and sweet potato, but were nothing special. Hooves up for the innovative oatmeal preparation as it was fried and topped with lemon curd, which was the highlight of our breakfast. Otherwise, there was nothing spectacular about the items we sampled, which tasted much like your average diner breakfast. Definitely a place to go for a solid breakfast, but by no means mind blowing like the diners on You Gotta Eat Here claimed. Mr. Moo, it certainly looks good. 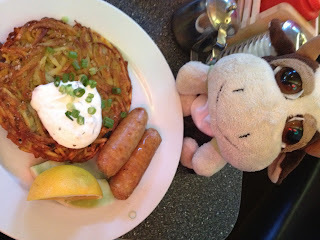 The hash browns and potato pancakes look yummy - yes, I'm overly addicted to carb-y wonderful things. The idea of a fried oatmeal ... I need some time to get used to that idea.